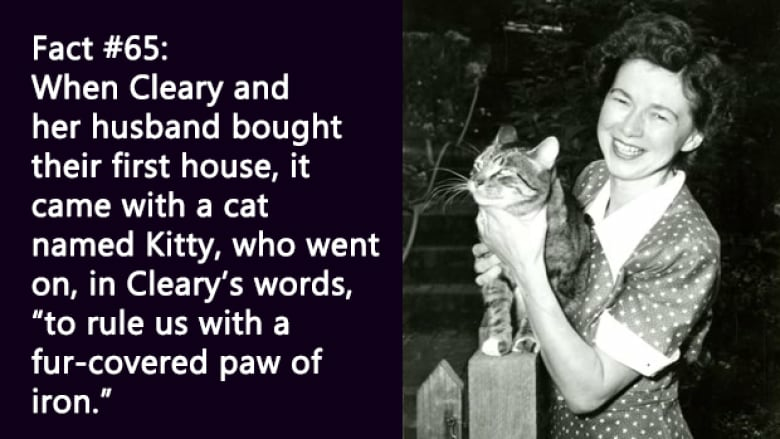 The beloved American children's author turned 103 on April 12, 2019. 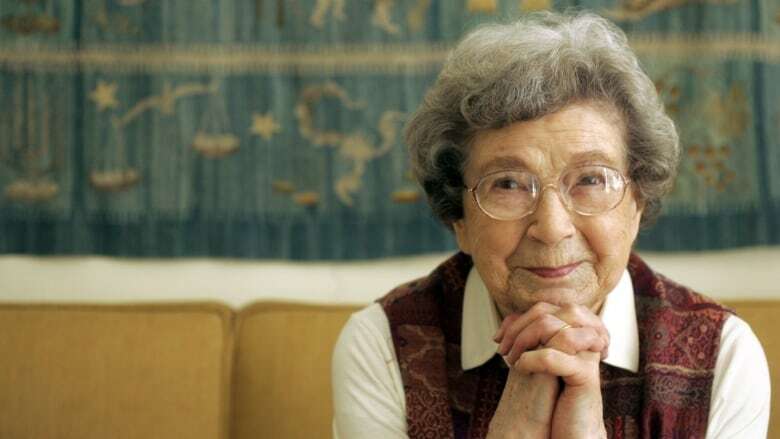 Beloved American author Beverly Cleary turned 103 on April 12, 2019. 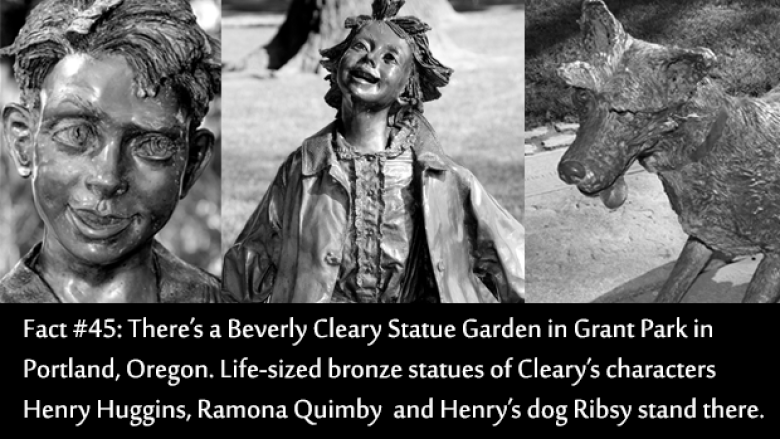 To celebrate, we collected these 100 amazing facts you might not know about the creator of Ramona Quimby, Henry Huggins and Ralph S. Mouse. 1. She was born Beverly Atlee Bunn in McMinnville, Oregon, on April 12, 1916. 2. She never went to kindergarten. 4. As a young girl, she lived on a farm in a small town called Yamhill, which didn't have a library until her mother set one up. 7. In high school, Cleary and a friend once discussed how long they wanted to live. They agreed that 80 would be a good cutoff date. 8. She didn't learn to read until the second grade and was put in her school's "low reading circle." 9. She did not take to reading right away. She says many of the books she read were published in England in the 1920s and the children had nannies and pony carts: "They seemed like a bunch of sissies to me." 11. The manuscript for her first book, Henry Huggins, was purchased for $500 in 1949. The publisher, William Morrow, wrote to her that "We all think this is going to be one of the exciting publications of the fall." 12. She graduated with a bachelor's degree in English from the University of California at Berkeley and later studied librarianship at the University of Washington in Seattle. 13. 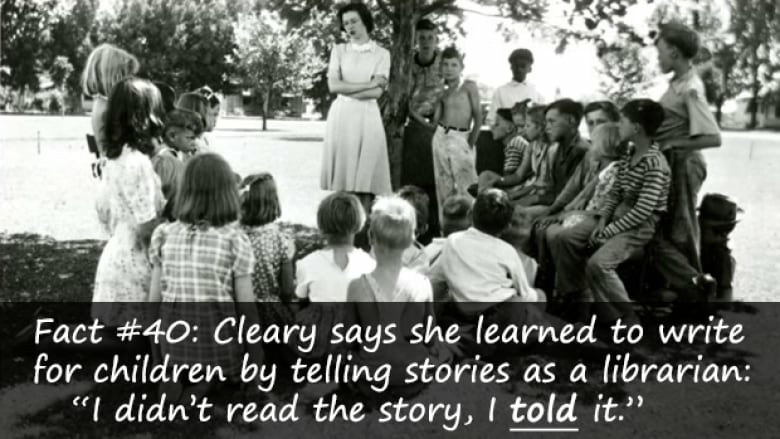 Before becoming an author, she was a children's librarian. 18. When she was working as a children's librarian, a student angrily asked her, "Where are the books about kids like us?" 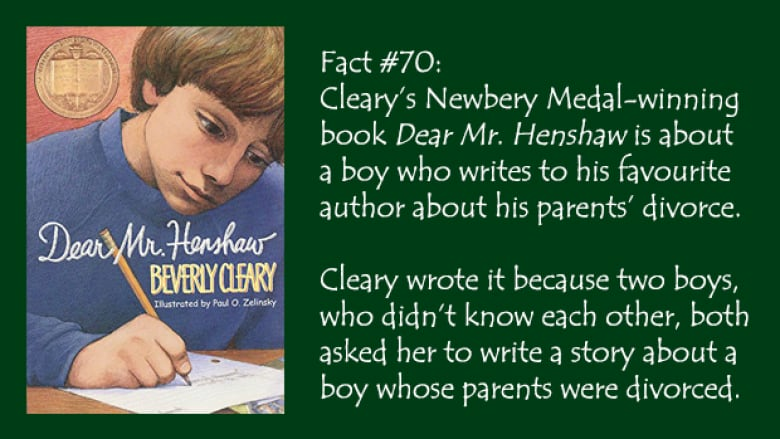 That inspired Cleary to create characters like Henry Huggins and Ramona Quimby. 19. 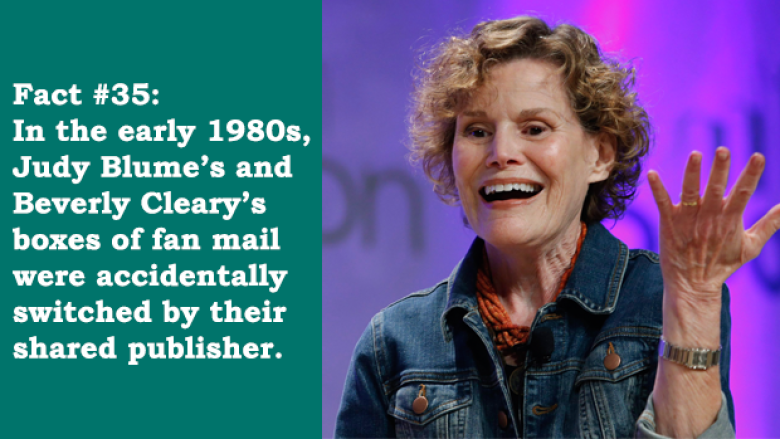 Judy Blume, fellow children's literature icon, is a huge fan: "Beverly, you were my inspiration when I started to write all those years ago. You remain my inspiration today." 21. When Cleary applied to college, she didn't expect to be accepted, and she didn't know how she'd be able to afford tuition if she was. When she got in, she pledged "by hook or by crook" to attend school. 22. 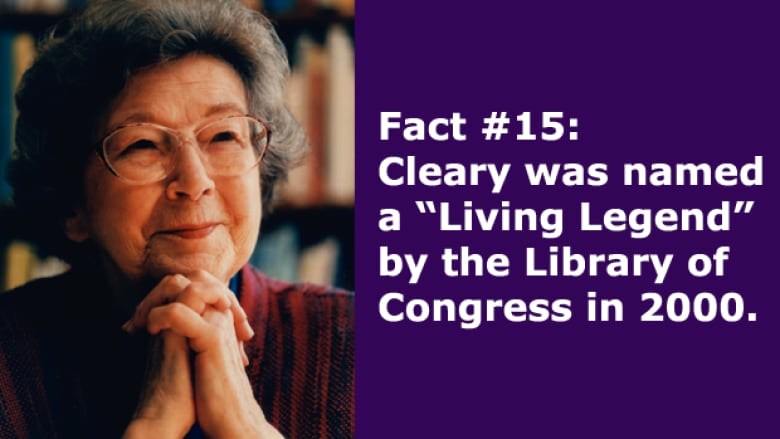 She met her husband, Clarence Cleary, at college. 23. Beverly and Clarence eloped in 1940. Her Protestant parents did not approve of the match, as Clarence was Catholic. 24. The Clearys raised two children, twins born in 1955. 26. Her former elementary school in Portland was renamed for her in 2008. A district representative said that when she agreed to the honour, she asked "if the school still smelled like a sawdust floor." 27. In her memoir A Girl from Yamhill, she writes proudly that her childhood home had the second bathtub in Yamhill County. 29. New editions of Henry Huggins, The Mouse and the Motorcycle and Ramona Quimby, Age 8 were released in January 2016 for Cleary's 100th birthday, with forewords by Amy Poehler, Kate DiCamillo and Judy Blume. 31. She now lives in northern California. 32. She has received thousands of letters from children talking about their problems and she responds to many of them. She remembers one boy who said that the only adults who paid attention to him were Cleary and his social worker. 33. When she was growing up, telephones were for adults. To get in touch with her friends as a kid, she would just stand in front of their houses and yell their names. 36. Cleary was horrified to learn that Blume's fans requested pieces of her garbage, and wrote to her, "This is ridiculous. You must be firm with them and not do these things." 37. Blume, a huge fan of Cleary, said the mix-up was "exciting" and her fan mail was "charming and adorable." 39. The army insisted that the books be dust-free, though Cleary argued that dust on the army base was inevitable. She ended up spending hours restocking books that cleaning staff had dusted off and stuffed back at random. 42. When illustrator Tracy Dockray signed on to do art for The Mouse and the Motorcycle, she received a card from Cleary that said her mouse ears were too big and she needed a "mouse model." Dockray ended up adopting a baby mouse from outside, which lived in her studio for the rest of its life. 43. In an interview about turning 100, Cleary remarked that she "didn't do it on purpose." 46. 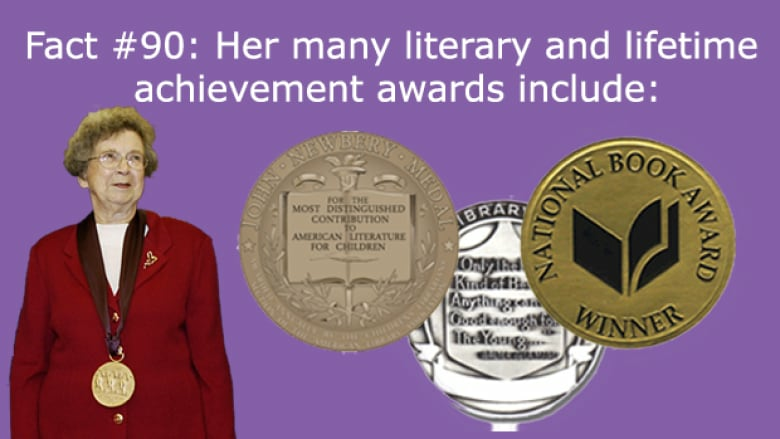 She published over 40 books before retiring in 2000. All of them are still in print. 47. As a child, Cleary — who grew up on a farm — named her doll after a nearby town and a tractor: "Fordson-Lafayette." 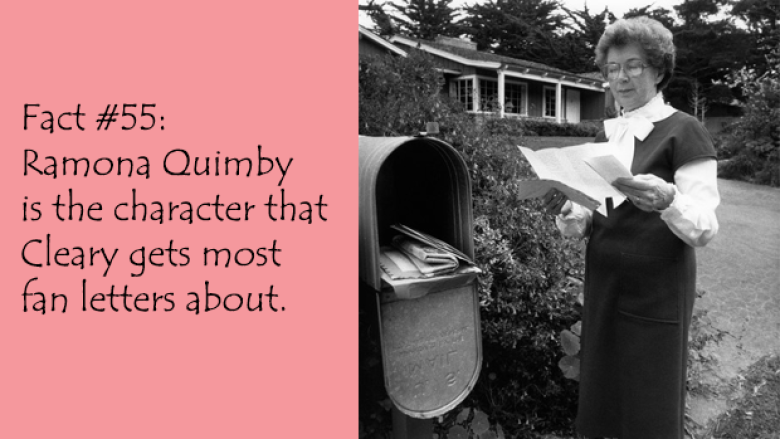 Her character Ramona Quimby names her doll "Chevrolet." 48. She never used outlines to write. 49. She says that a line from a college English professor has guided much of her writing: "The proper subject of the novel is universal human experience." 50. 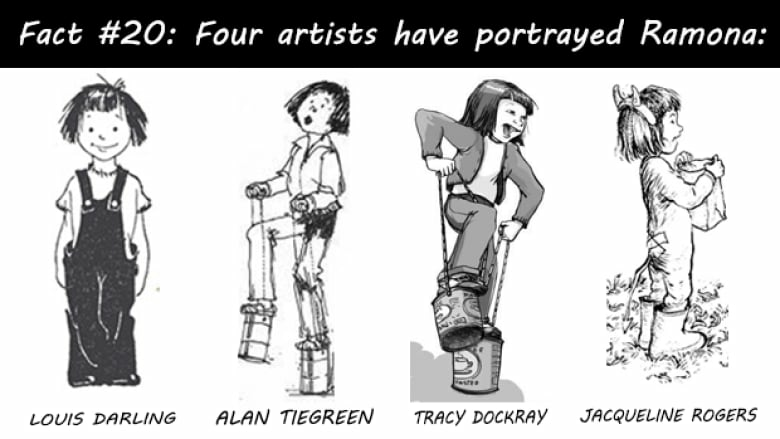 Beverly Cleary has appeared twice on CBC. In 1968 she discussed writing for children with Vancouver Weekend News, and in 1980 she appeared on Ideas to talk about her teen novel, Fifteen. 51. When asked which of her characters she'd most like to have dinner with, she said, "I'd really like to have dinner with all of them, if they chewed with their mouths shut, sat up straight and minded their manners." 52. She's a big supporter of the D.E.A.R. (Drop Everything And Read) program in elementary schools. 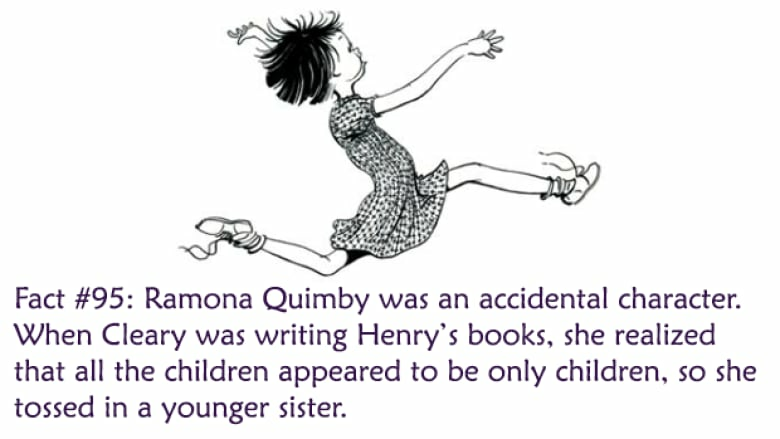 One of her characters, Ramona Quimby, participates in D.E.A.R. time in her books. 61. She does not own a computer. 62. Her first memory is of hearing the church bells of her hometown, Yamhill, ringing all together to celebrate the end of the First World War. 64. 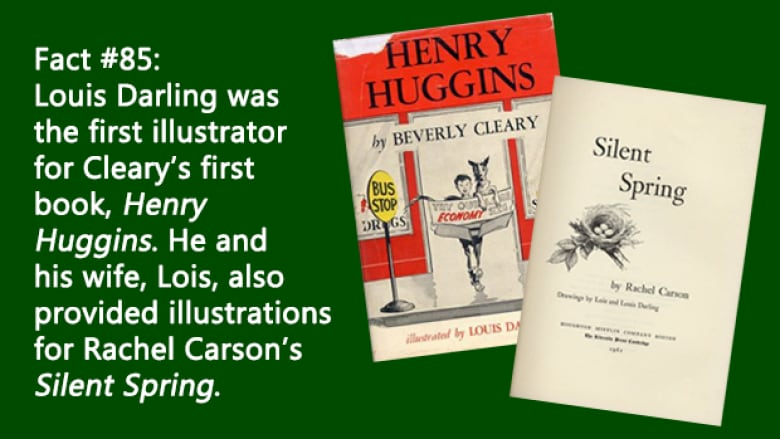 Her first published story, "The Green Christmas," was published with someone else's name on it by accident.¹ Many years later, Cleary would rewrite this story as part of her first book, Henry Huggins. 66. Her cat would sometimes sit on her typewriter keys while she was trying to write. 67. Just as Ramona Quimby's family struggled financially in the books, Cleary's parents suffered through financial hardships. Her father had to sell his farm in the early 1920s, relocating his family to Portland where he would later lose his job during the Great Depression. 69. While waiting for a response to her manuscript for her first book, Henry Huggins, Cleary confided to her mailman that she was hoping for a large white envelope with a publishing contract. So he started watching too. One day, he came running up to the front door with the envelope and excitedly watched her open it. 71. The title characters of the book Mitch and Amy are the only characters inspired by Cleary's twins, because she found it hard to write while "the characters were running around the house." 74. When asked where Ramona would be when she grew up, Cleary said she didn't know, but that "she might go backpacking around Europe." 78. Cleary enjoys seeing theatrical adaptations of her work — but only when children play the children's roles. She does not like it when adults play children's roles. 79. 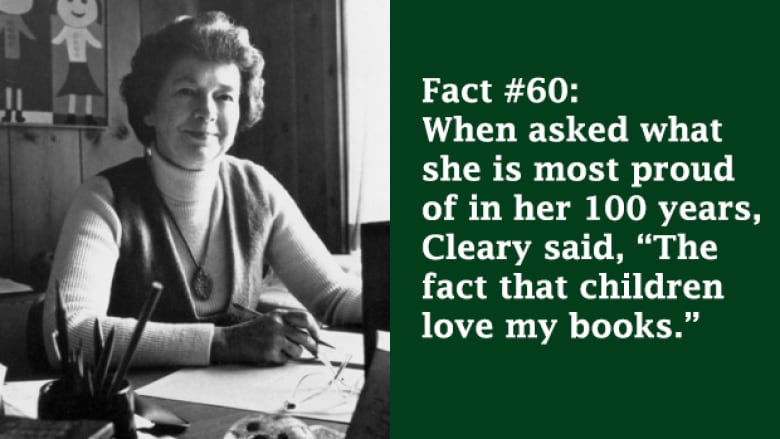 Oregon Public Broadcasting produced a documentary about Cleary for her 100th birthday. You can watch it here. 80. The Ramona series became a 10-episode television show in 1988, starring Sarah Polley. It was filmed in Canada and aired on PBS. 82. Cleary's maiden name is Bunn. Boys used to tease her by singing "Hot Cross Buns." She hated it. 83. Cleary wanted the 2010 movie Ramona and Beezus to be as timeless as the books, so she insisted on getting rid of anything that might date it — like technology, slang or clothing trends. 84. In the first draft of Henry Huggins, Ribsy the dog was originally named Spareribs, after the dinner Cleary had waiting for her in the refrigerator while she was writing it. The editor suggested a more child-friendly name. 86. Cleary had poor eyesight and struggled through school for years without glasses because her mother feared they would ruin her appearance. 91. Cleary's hobbies are travel and needlework. 94. Cleary's son Malcolm says the only difference between his childhood and those of his friends was that his family had a bigger mailbox to accommodate all of his mother's fan mail. 97. Cleary once asked Elizabeth Allen, the director of the 2010 Ramona and Beezus feature film, what the themes in the story were. Allen said, "It's about this iconoclast who's learning how to navigate in society." Cleary replied, "No. It's about growing up." ¹From Cleary's first memoir, Girl From Yamhill. 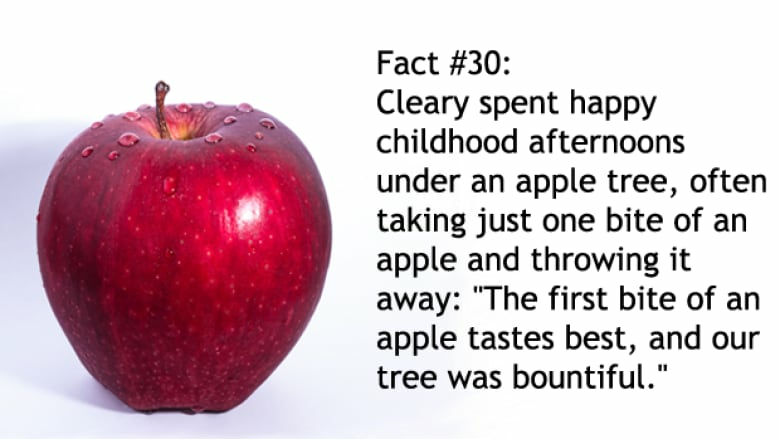 ²From Cleary's second memoir, My Own Two Feet. This list was originally published in 2016. 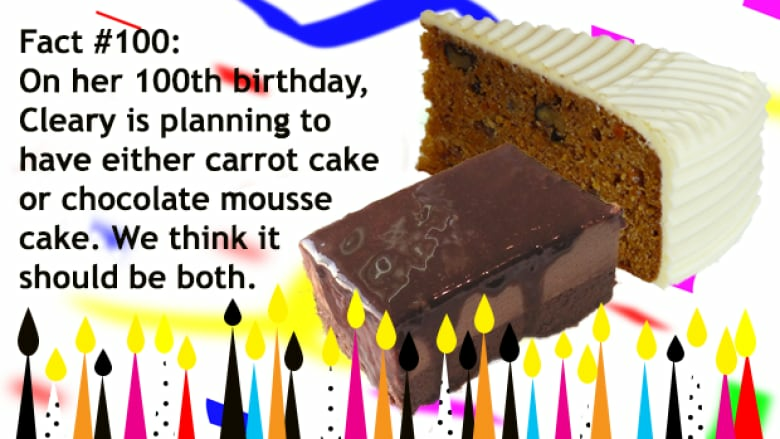 It was updated in 2017, 2018 and 2019 for subsequent birthdays.